Michael Van Hout started creating professional art over thirty-years ago after studying Forestry at NC State University and graduating with a BSA degree in sculpture from the University of North Carolina at Greensboro in 1980. His large installations of animals made of wire, copper, and other metals are in Airlie Gardens, The NC Aquarium at Fort Fisher, and Greenfield Lake Park in Wilmington, NC. In addition to wire and metal sculpture, Michael creates wood sculpture, woodcut prints, mixed media, mobiles, paintings, and various commissioned pieces located in museums and in private and public spaces. In 2004, Michael was a part of a team of seven artists, each of whom created their own sculptures for the Airlie Gardens Bottle Chapel, a tribute to renowned artist, Minnie Evans. In addition to Michael, the Bottle-Chapel group included his sister, Brooks Koff; Virginia Wright-Frierson; Karen Crouch; Dumay Gorham; Hiroshi Sueyoshi; and guest artist Tejuola Turner. 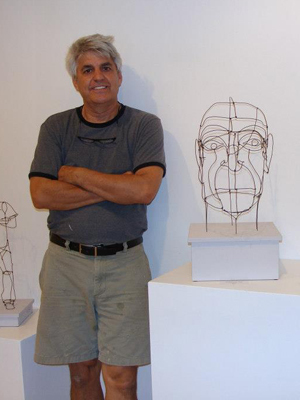 Michael’s current work includes galimotos, dynamic wire sculpture with wheels that turn. In 2016-17, he completed a 3-dimensional metal sign for Foxes Boxes Restaurant at 622 N. Fourth Street and art for a historic shirt factory recently converted into apartments. The art includes wire sculpture in a pocket garden and a mural covering the entire wall of the entrance to South Front Apartments, 1510 S. Third Street in Wilmington, NC. Michael continues to contribute to the community through his work at DREAMS of Wilmington, Cameron Art Museum, and Leading Into New Communities (LINC). Michael’s studio is at ACME Arts 711 N. Fifth Avenue where he continues to collaborate with other artists and to encourage people of all ages to use their creativity. He currently lives in Wilmington, NC with his wife, Marlisa, a mental health therapist.